I’ve seen it time and time again. An organization has a new technology, often joined with a new process and vision for processing, customer service, data alignment, sales, etc. The knock comes on L & D’s door, and we are thrilled to be able to get in on a new initiative without the baggage of poor performance leading the request. But just as we should pause and assess if training is the part of the solution to substandard performance or a new change initiative, we need to also pause to think about the appropriate timing and type of training that will advance the strategy initiative. While it might seem counter-intuitive to those of us in the instructional design and training game, we need to think about training as an essential element in the organizational kitchen remodel — a part of a well-designed program, but not the driver. OK, I’m not entirely sure a kitchen is the best analogy, but let that marinate with me for a moment. A kitchen needs a workflow plan, a place to store fresh and nonperishable items, ample space to store tools and cooking utensils, and a set of good cook books (explicit knowledge), at least until the cook moves through competence and proficiency to become an expert intuitive gastro-artist (implicit knowledge). So, training can carry the novice cook along the path to competence, and even proficiency. However, if the goal is to build expertise, training can’t carry the load the full distance. Similarly, the training program, no matter how well designed and implemented, can’t deliver the tools, materials and setup necessary to get the anticipated results. Cathy Moore has done some excellent work on how to evaluate the need for training to address performance issues. But what I’m suggesting here is to take that to another elevation: Even when training is part of the issue, are the conditions for applicable success present? Seen this way, each training design should be a mini (or full-blown) change management program. Per standard practice of change management, skills are an essential ingredient. But so too are organizational support, vision and incentives to follow through. So, if you are already in the discussion that Moore (and I) suggests, take it to the next logical step: How does training fit into the change the organization wishes to see? We don’t spend the money to build a beautiful kitchen without the hope that we’ll become better cooks. But design and appliances don’t get us there. Neither will skills alone without the proper tools and support for experimentation, failure and improvement. Personal learning is a form of assembly, where we find, evaluate, use or discard things we encounter on our way. More often than not, though. we won’t know the meaning of what we discover until long after the fact. Over time, with experience, we’re able to create meaning of (from?) objects, assembling them into applicable learned compounds. “I read it in the Times.” “Our CEO thinks that we should redirect our efforts.” “My trusted financial adviser recommended I put my money into tech.” “My mentor said this book was important.” “I ask my assistant to provide me with daily clippings.” Information was scarce, and we looked to those with expertise, time, and the resources to research and bring us information we could use. Those days are done. We create our own meaning now. 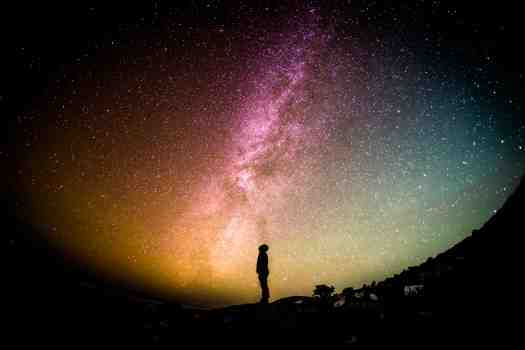 We divine it out of the countless dots – the nodes in our network of people, ideas and information – that fill our universe. Like ancient explorers, we connect dots and create patterns in order to navigate through our world. Photo by Greg Rakozy via unsplash.com. The solution becomes not one of knowing what is useful, but of deciding what to pay attention to, and weighing whatever we find for its potential value. There is no way to pre-sort what is worthy; there is simply too much out there and exponentially more being created all the time. Like the scroll at the bottom of a 24-hour news station, we barely notice it’s there. When something catches our attention, we have that “Wait! What was that? !” moment. It’s much the same to navigate through our connected, networked world. Something catches our attention, and we make an immediate judgement: This is something I should pay attention to, something I might be able to use at some point. Or not… let it pass. The decision is the key. Yes, I like this idea. This is new to me and sparks my interest. This is from a known source that I already trust, so I’m willing to give it a little more attention than I might otherwise. Once a decision is made, apply your process. Clip, copy, save, share it, while tagging in some way that you’ll be able to find it later (that takes practice, but you’ll get better at it with time). Note why you thought it was worthy of carrying with you on your journey: That is a critical part of it, and will inform and refine your knowledge management practice over time. Weigh it for its value over time. Does the idea make sense? Does it add, extend, amplify or purposefully redirect what I do and what I know? Cull frequently, letting go of what it no longer useful. By following this process, you’ll create your own meaning, and build your own unique area of expertise that is yours alone. That is an exciting proposition. When each of us is self-directed to build our own knowledge, to create our own Personal Knowledge Mastery (PKM), we bring a unique perspective and ability to any organization’s collaborative or cooperative effort. That is a valuable place to be. Chess is a game of constant striving, where even the greatest mastery is put to the test in search of constant improvement. Shouldn’t workplace learning be the same? If you are even a rudimentary chess player, I expect that this analogy will ring true. But even if you have never played chess, the idea of laying out vision, goal, purpose and context in which learners can apply their nascent skills is a critical component to any complex/compound learning design. The learning game, be it chess, sales or facilitation skills, begins with a vision. If the learner can understand where their newly acquired skills will take them, they (hopefully) will develop the tenacity and trust to stick with the rudimentary practice that forms the framework for skill development. In chess, that begins with the end. That seems an obvious statement, but I have often observed that people want to begin by explaining the pieces: The King, the Rook, the Bishop and Pawn. But those are abstractions to the novice, only meaningful as tactics and strategy is formed as part of understanding the game. 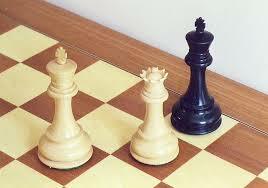 Instead, start with the end vision: Check mate! 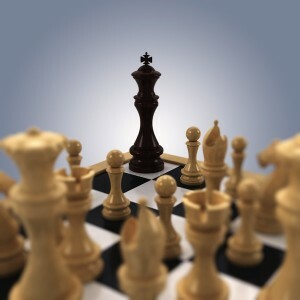 Starting Point: This picture has no relation to actual chess play, but it drives across the vision — trap the other king. Once learners have a vision of the game, next move on to the goal of chess (no, not how the horsey moves – not yet! ), which is to move your pieces around in order to achieve the vision. An explanation of capture-and-removal can be introduced here, but only as an idea, not as a tactic (yet). Have the learners move the players—with no regard to actual game play or rules—so that they achieve check mate. That’s the goal: Trap your opponent’s king into an immobile position. Enter your opponent! Now the purpose of game play, of each move begins to take shape. Purpose translates into action in a way that goals and vision do not. Not only are you out to contain your opponent’s king, she means to contain yours, too: Offense and defense. Now the ways in which the pieces move, and how to strategically deploy them, how to occupy space on the board, and how to string strategy into tactics, begins to make sense. The purpose is to win the game by out-planning and out-executing the forces that align against your success (your opponent). With a grasp of purpose, each move is seen in the context of the whole, a stage in the game, the situation of each player now as a result of actions taken (or not). This is where skills are built, and learning becomes knowledge. Theoretical principles (goals and vision) are put to the test, and failure leads to success, leading to deepening understanding. This (idealized) real version of checkmate only makes sense once you can identify the pieces and understand their properties. Play becomes practice, practice play. The only “real” way to learn something on a deep level is to make your own mistakes, learn from them, all the while building up your ability to apply purpose and context to the ever-changing conditions. Practice allows learners to demonstrate progressive skill acquisition and to show evidence of deepening understanding. Visibility, transparency, narration and inquiry are key to good practice. And all play is practice – the learning never stops! Imprison opponent’s king Place your pieces into position on the board to capture the king Capture the opponent’s king while defending your king from capture. Make good incremental decisions to achieve goal. Your pieces have different properties, and you use those properties to defend and create an offensive strategy to advance your purpose. Think strategically at every decision point, align actions to goals, purpose and current context, iterate, experiment, fail, and succeed: In other words, learn! So, starting with the end in mind: Do you allow your learners to demonstrate, narrate and explicate their actions in a supportive, non-judgmental learning environment? If not, how can you measure what they’ve learned? That’s the foundation on which everything else is built. Practice never makes perfect, but ongoing improvement is only achieved through ongoing visible practice.